That tool only covers one page. And it doesn’t give you a list of keywords you SHOULD be targeting! And it doesn’t analyze your competitors either! Imagine if you took your car to the mechanic and asked them to check the tires. And they did that… but there was really a problem with the engine. That’s a problem right? Can we agree on that? 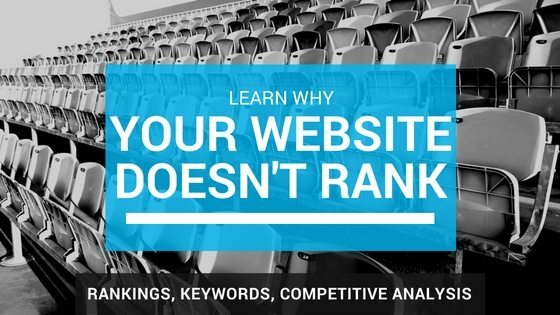 Let Marketing Heroes do a more in-depth analysis of your website and figure out all of the things that are wrong with it and holding it back from ranking. And then we’ll not only do that, we’ll find out the keywords that you really NEED to be ranking for. Not just the ones you think you might need to rank for. You see a LOT of times, clients will think people search for one thing and they’re completely wrong and people search for other keywords – and THAT’s what we need to rank for. My team has really awesome tools that we can run to find out EXACTLY what you need to be ranking for. And then on top of all of that – we’ll analyze your competitors as well! We’ll dig into their site’s and figure out why they’re beating you. Then, after my crack team is done with all of that – we’ll wrap it up into a nice report with a checklist of things to fix, they keywords you need to be ranking for and a list of your COMPETITORs keywords and what THEY’RE doing RIGHT! And we call this the ULTIMATE SEO AUDIT. What’s in the Ultimate SEO Audit? Now we normally charge a one-time fee of $297 for this because frankly – it’s a lot of work. It takes my team usually 2-3 business days to do all of this. But for the next 30 days – we’re running a flash sale on the Ultimate SEO Audit and offering it for $97. We’re practically giving away our time! However, here’s the bad news. We’re limited by our time (it’s the only thing I haven’t been able to figure out how to multiply) and how many businesses we can offer this to. So we’re shutting this down on October 14, 2016 at 5pm CST. Start Now for $97 One Time! Click the button below to order the Ultimate SEO Audit now and learn how to fix your website and beat your competition! p.s. This price won’t be available much longer, so grab your Ultimate SEO Audit now and learn how to outrank your competition!